Hushme: Cool or Weird? No ratings yet. Hushme is the weirdest headphone we’ve seen, but still the one of the most useful wireless headphones ever created. 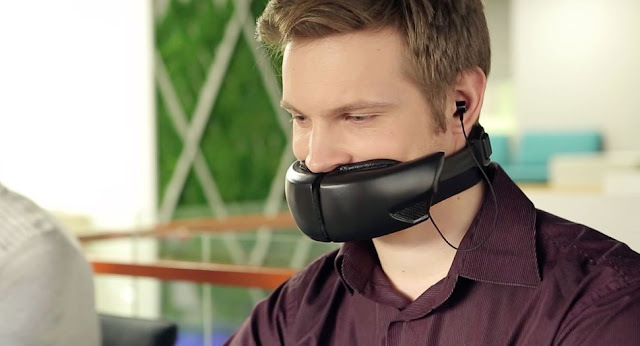 Perfect for the office environments, Hushme is still in the development stage, its a Bluetooth headphone and has a muzzle design that lets you have private conversations. So Hushme might also make a good present for that loud annoying boss or colleague. Hushme, which is the “world’s first voice mask for mobile phones” is worn as a standard neckband style wireless headphone it has integrated ear buds which allows you to muffle your conversations. As an added bonus, when you’re in masking mode, the headphones connects to a free app that allows you to overlay masking sounds onto your voice. These also an external speaker on the outside of the headphone, that allow you to use sounds like the wind, rain, monkey and squirrel, as well as Darth Vader, R2D2 and Minion. There might be some licensing issues with a few of those sounds. Hushme was Created by a group of Ukrainian engineers. As I said, Hushme is planning a crowdfunding campaign later in 2017 and expects the headphones to be priced at less than $200. You can use the headphones on the go, but their biggest market is probably for all those folks in open-offices who are looking for some on-demand privacy. Read also: The app for effective typing while walking!